In the last few years, my wardrobe has slowly been taken over by one brand in particular: Flint and Tinder. Just about every day, you can find me in at least one piece made by them — be it pants, a shirt, a jacket, or even underwear. Their clothes strike the perfect balance between functionality, style, and comfortability. Plus, everything is 100% Made in the USA. 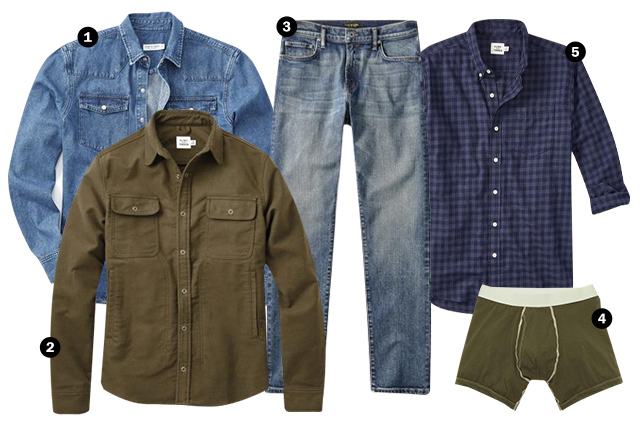 Especially come fall, you could entirely outfit yourself with Flint and Tinder wears. And so below we present just that: two different fall get-ups that feature the best of Flint and Tinder’s offerings. 1. The Rain Jacket: Ridge Shell. This new offering from F&T takes hints from both shell jackets and mountain parkas. The Japanese nylon is water- and tear-resistant, but it’s also just dang warm for chilly, wet days in the fall and winter. 2. The Everyday Jacket: Waxed Trucker. In addition to the water-resistant shell, your fall wardrobe should also have one of these bad boys, which only gets better with age, acquiring a nice, personal patina. Made with waxed, weather-resistant sailcloth, the trucker jacket is soft right out of the box, and can be worn with just a tee underneath since it’s fully lined with soft cotton flannel. Perfect for fall when you’re regularly adding and subtracting layers. 3. The Weekend Wear: 10-Year Hoodie. The best hoodie you’ll ever own, bar none. Not only is it super comfortable (and gets softer every time you wear it), but it’s cut more like a button-up shirt than a balloon-like sweatshirt. So it just looks really good, even if you take it out and about. Guaranteed not to shrink. 4. The Base Layer: Slub Pocket Tee. It’s likely your t-shirt drawer needs an upgrade. But it’s just so hard to part with those uber comfortable, well-worn tees you’ve been wearing for a decade. Lucky for you, this slub tee is super soft right out the gate, feels great against the skin, and is lightweight and ultra breathable (just like your old favorite). 5. The Pants: 365s. Combine your favorite tailored chinos with the stretch of a performance pant, and you get the 365 — a pant so comfortable, you’ll want to wear them every dang day of the year. Even the slim-straight option maintains comfort and move-ability. Now with new color options for the fall season. 1. The Throwback: Bone Button Western Shirt. An authentically-styled Western shirt with a frontier attitude. In the Old West, snaps were preferred to sew-on buttons because of their superior durability. Flint and Tinder took that idea up a notch and went with burnt cow bone snaps, meaning each button has unique markings. Cool. 2. The Outerwear: Moleskin Shirt Jacket. The perfect combination of ruggedness and softness. Made in a classic workwear silhouette, this shirt jacket takes the comfort of traditional workwear up a notch with a heavyweight cotton that’s brushed to perfection. 3. The Denim: All-American Jeans. Feels like your best worn-in pair of jeans right out of the box. With just a little bit of stretch material added, this denim offers unrivaled flexibility and comfort. Will quickly become your favorite jeans. 4. The Protection: Heritage Boxer Briefs. The softest underwear you’ve ever pulled on, and the custom-woven waistband is ultra-comfortable and keeps your drawers up where they belong. 5. The Everyday Shirt: Check Button Down. Like the casual vintage shirts of old, this check button down is made with premium Japanese cotton that wears in, not out. Rather than the ratty sweatshirt you usually find yourself in at home after work and on weekends, this is a plaid so soft you’ll want to be putting it on instead. Join Huckberry’s 1 million+ adventure community. We deliver the best clothing and gear at the best prices, inspirational stories, and a hell of a lot more to your inbox every week. Membership is free and takes seconds. The post Outfitted & Equipped: A Flint and Tinder Fall appeared first on The Art of Manliness.